Happy Easter all. I am a firm believer that holidays are best spent with family and food. We over indulged today but it was all tasty. The morning started with a brunch after church. 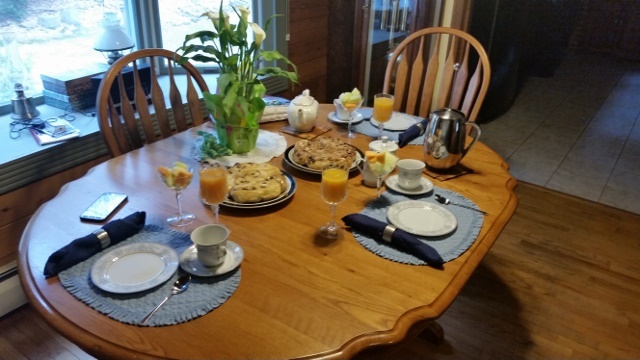 Sticky buns, fruit cups, mimosas and tea or coffee. It was only 31F at 10 AM so the hot beverages went well. 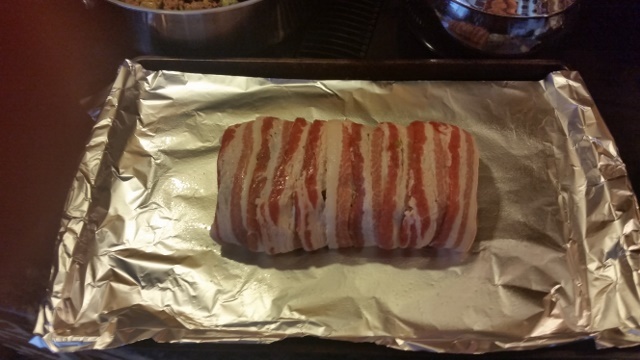 The main course for dinner was a pork roast wrapped in bacon. Here it is pre-oven. Post oven this is the roast and the potato dish - Potatoes Romanov. 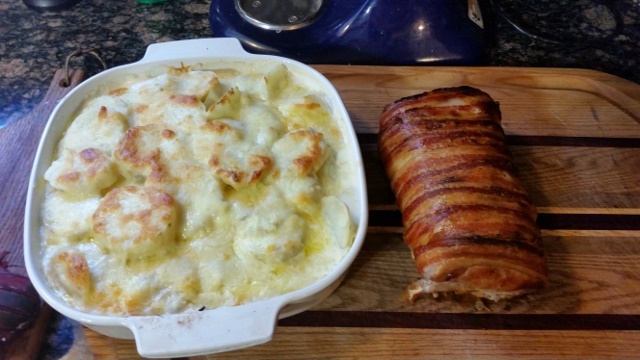 A sinfully rich potato casserole with sour cream, cream cheese and cheddar cheese for the sauce. Both are resting prior to serving - the roast to redistribute the juices prior to carving and the potatoes to cool down. This is the meal plated and served. 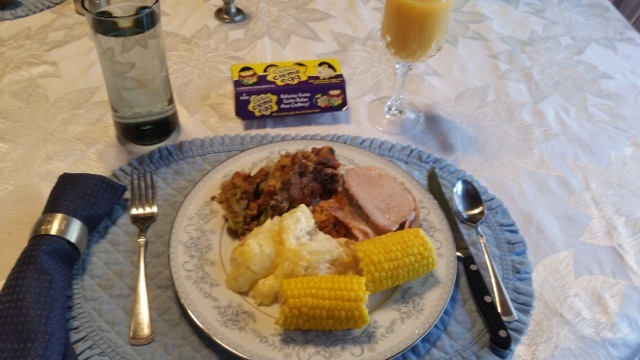 The roast, corn on the cob, potatoes and sausage stuffing. It was very good. We relaxed after dinner but eventually had room for dessert. 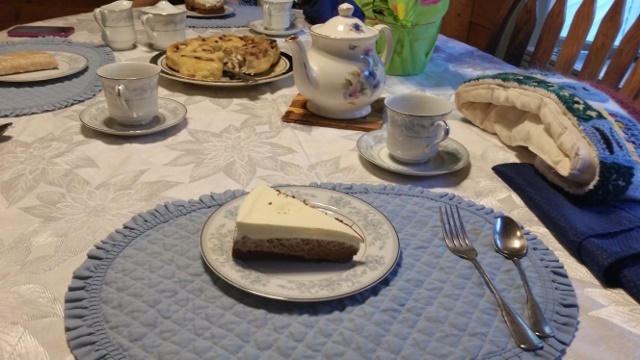 A triple chocolate mousse cake served with tea. You do realize these pictures constitute cruel and unusual punishment, don't you? For Easter I enjoyed Easter eggs. And they were colored like the eggs below. My aunt and uncle don't play. If you leave their house hungry on a Holiday, it's your own fault. 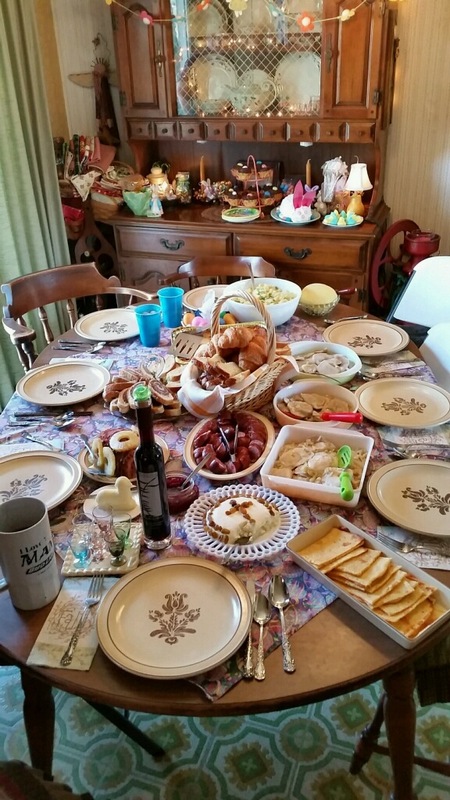 This was the spread there this afternoon. Alphege Love those Easter eggs. Did you make them? Todd, What is the cake like item with the golden raisin cross in the bottom of the pic? Very nice - you had me at bacon.